Take two of the world's finest musicians and blend the sultry, exotic voice of Brazil. This is Sussurro. The name is Brazilian for "whisper" and conveys the acoustic delicacy this unique trio can bring to music from all parts of the world. Hear and see the irresistible, percussive rhythms of Carnivale to the exquisite softness of Norah Jones and Diana Krall, as well as stunning contemporary versions of the likes of Sting and Prince. Songbird Jeanne Bastos is native to Bahia Brazil, has toured Europe and worked for many years in Japan. Hear familiar repertoire sung in authentic Portuguese, gentle Bossa Nova to the fever of the Samba. Then enjoy the total originality Jeanne and two innovators bring to songs from the pop genre. 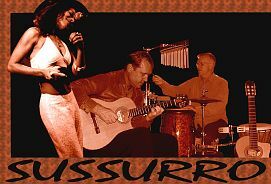 Watching Sussurro perform is as exciting as their fresh, unique sound. No computers, only music. See webpages on this site for Dope and Peter Toohey.